To decrease the incidence of falls amidst 230 Australian citizens residing under care facilities with the aid of interventions directed at multifactorial and single platforms for a duration of seven months. 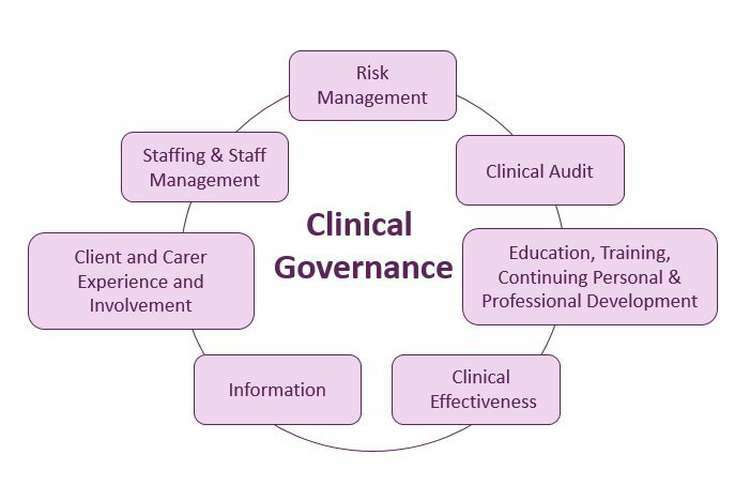 Clinical governance is defined as the set of frame work that aid in maintaining superior care and facilitate the quality of the care provided by the health care professionals within the clinical setting (Van Zwanenberg& Edwards, 2018). Clinical governance generally obtained by the extracting data from the evidence based practices, health care professionals, evaluation of the data relevant to the issues, proper business management of the issues and policies to reduce incidence. Clinical governance highly relevant to fall and subsequent injury due to risk factor in elder people in Australia. It is also relevant to the identify risk factor such as the prevalence of fatal injuries pertaining to the head and facial regions of the concerned patient, along with the threat of partial or complete loss of mobility..Five different pillars are relevant for managing injuries resulting from falls in patients such as clinical performance, evidence based care and effectiveness, clinical risk and professional management along with consumer values (Tuan, 2016). In this context, the sudden fall considered as one of the major issues in elder people of Australia and older people experiences the physical injury and psychological distress due to ended up in hospital.. So, fall prevention in older individuals is related to the clinical risk pillar of clinical governance since it focuses on the safety of every older individual and residential care(Tuan, 2016). Fall is one of the major cause of disability and death in older people , especially women.According to the statistics of south Australia, 2017, approximately 110 people of 65 years or more than 65 years were admitted to the hospital due to the hip fracture.Australian Bureau of Statistics reported that approximately 1200 deaths post fall were registered in 2008 and the risk was increased every year by 2% due to risk factors (Vlaeyen et al., 2015).Global report of WHO also suggested that 1.3 million patient over the year experienced death due to sudden fall in residential care and each fall cost average approximately $ 1000(El-Khoury et al., 2015). In residential or hospital setting, most of the sudden fall of older individuals is unintended and the consequences are physical injury, long term limb impairment, emotional distress, social isolation, impairment of daily activity and death. However, the causes of sudden fall are preventable and can be avoided by collaborations of different health care members and certain precautions. Excellent teamwork is obtained by involvement of staffs in the direct care of the patient and resolving the issues successfully. Involvement of multidisciplinary team members is essential for implementation of fertility preservation strategies. Australian commission on the safety and quality in health care listed number of worker in health care setting for preventing the issue. Medical practitioners are responsible for preventing sudden fall in diverse ways such as proper interventions and diagnosis (Arena et al., 2015). They also actively participate in implementing the strategy. health care mangers involve in the proper assessment and actively participated in the implementing standard fall prevention strategies. nurses are the most trusted health care since they provide the direct care to the professionals. They communicate with the patient and the family members to provide adequate information and patient history (Forsythe et al., 2016). Allied health professionals are present for managing falland various plans for assessing environment, the atmosphere of care and individual needs. (Forsythe et al., 2016). Supporting workers actively take part in the strategies pertaining to the assistance other health professionals in daily activities such as food preservation, transferring things, maintenance of hygiene. Clinical practice improvement is defined as a n improving strategy of the quality of the care bin clinical premises through the superior diagnosis methods, access to the advanced technology, planning and interventions and evaluating the efficiency of the interventions. (Kayhan, Kar& ?ahbaz,2015). For implementing superior strategies in the clinical setting different frame works are used mostly for the small projects. PDSA can be the excellent tool for this prevention in which the cycle starts with the developing strategies considering all the area of concern and proposing an idea for specific intervention for solving this issue. This followed by the collecting data of frequent fall in older individuals. In this project, the importance of plan to do study act is to identify the reason behind the certain fall in residential care for strategizing the plan (Knudsen et al., 2017). The strategy is made to reduce the fall in older patient where interventions, data methods, key stake holders should be selected. For reducing the fall, planning should be made such as taking the history of the patients, medication review, environment status, vitamin supplements, facility of physiotherapy,and health status of patient. Then interventions execute in the larger scale and frequent study and improvements should be monitored by data collection (Oliver et al., 2017). Conclusion is made after comparing the results of the patient for better outcome in future for the issue. Therefore, PDSA is appropriate tool for determine the effectiveness of strategies for the issue in order to improve quality. In order to implement proper plan, detailed observation and marketing analysis should be done for the cause and incident report of fall. Since fall is multifactorial, the multifactorial approaches such as assessment of risk factors along with mobility of the individuals, involvement of physiotherapy , care of osteoporosis, improvement of social and personal behaviour , vitamin supplements, treatment for other body impairments, use of restrictive side-rails also prevents bed-related falls in elderly people in residential facility, use of flat footwear(El-Khoury et al., 2015).a study suggested thatZhang et al., (2015), light exercise in home helps to stabilize gait, restore the movement and helps to improve the cognitive behaviour of individuals. In conclusion from the study, the strategy for preventing fall always differs depending on health status and age of the patient and cognitive activity related to fall. Considering all the possibilities, health care professionals should provide feedback on the efficiency of the interventions and effectiveness using the PDSA cycle for executing the plan in larger scale. Lack of accurate, advanced technology and lack of sound knowledge of the practitioner act as a major barrier of the practice. Majority of the patient reject options of these interventions due to the personal beliefs and cultures which is the massive hindrance to clinical practice (Willson et al., 2017). Implementing these changes are challenging in certain areas since evaluation of effectiveness of multifactorial approach is challenging and time consuming.Limited resources, improper budget plan, lack of time, feeling of loss of independence by resident, health condition of patient, lack of effective communication in between health professionals, influence of society, and lack of assessment tools and so on. Clinicians and mangers played significant role in resolving the barriers through the effective planning such as implementing the inventions such as medications free of charge , motivation of staffs, effective communication, proper education (Lamb et al., 2015). Recruiting more health professionals and care givers with sound skills can reduce the issue. The main objective of the study is to prevent fall patient through implementing various approaches in clinical setting. Effective evidence based practices along with different studies and data should be followed by all the stakeholders in order to manage the fall (Carande-Kulis et al., 2015). In clinical setting, nurses play important role in proper communication patient and providing adequate knowledge, maintaining safety (Knudsen et al., 2017). The efficiency of the different implemented therapies can be compared through the chart and statistical data. Thus, to in order to make the intervention plan successful and execute in future, appropriate assessment of the patients, proper documentation of efficiency and involvement of all key stakeholders are important. 2. Carande-Kulis, V., Stevens, J. A., Florence, C. S., Beattie, B. L., & Arias, I. (2015). A cost–benefit analysis of three older adult fall prevention interventions. Journal of safety research, 52, 65-70. https://doi.org/10.1016/j.jsr.2014.12.007. 3. El-Khoury, F., Cassou, B., Latouche, A., Aegerter, P., Charles, M. A., &Dargent-Molina, P. (2015). Effectiveness of two year balance training programme on prevention of fall induced injuries in at risk women aged 75-85 living in community: Osséborandomised controlled trial. Bmj, 351, h3830. doi:10.113 6/bmj.h3. 8. Lamb, S. E., Jørstad?Stein, E. C., Hauer, K., Becker, C., & Prevention of Falls Network Europe and Outcomes Consensus Group. (2015). Development of a common outcome data set for fall injury prevention trials: the Prevention of Falls Network Europe consensus. Journal of the American Geriatrics Society, 53(9), 1618-1622. Doi:10.1.1.930.3623. 9. Oliver, B. J., Potter, M., Pomerleau, M., Phillips, A., O’donnell, M., Cowley, C., &Sipe, M. (2017). Rapid Health Care Improvement Science Curriculum Integration Across Programs in a School of Nursing. Nurse educator, 42(5S), S38-S43.http://clinicalmicrosystem.org/uploads/documents/Rapid_Health_Care_Improvement_Science_Curriculum.9.pdf.